*This essay first appeared in July 2018 on The End Time. I have edited it and updated it. Enjoy. For example, Joanna Gaines of the popular HGTV television show Fixer Upper said she heard God’s voice clearly. Jennie Allen who founded If:Gathering, said a voice from the sky directly told her to start that organization. Since this essay was originally written, we can add Franccis Chan to the long list of teachers in Christendom who claim to hear directly from God. Chan said that his “theology left some room for hearing directly from God,” and it seems that God entered that room and now regularly speaks to Chan. He uses charismatic language to describe personal revelations from God. “On the plane here, it was revealed to me…” He said the Lord began instructing him to give away specific amounts of money, $50,000, $1M and so on. During The Send pre-rally in January 2019, Chan said he was given a room for an hour alone to commune with God in scripture and prayer. It was during this meditative moment that Chan divulged exact words God said to him. Ladies, beware of how dangerous it is to claim to have heard directly from God and put quotes around the ‘message’ and use the pronoun “I”. Hybels there is actually speaking FOR God. Putting words in God’s mouth is not something you want to do. Ever. Yet Sarah Young heard from God and wrote a book quoting everything he (allegedly) said, and it’s still a bestseller 14 years later. What God began to say to me about five years ago and I’m telling you it is in me on such a trek with him that my head is still whirling over it. He began to say to me, ‘I’m gonna say something right now, Beth. And boy you write this one down. And you say it as often as I give you utterance to say it. I love this one, ‘I could tell by the sweet tone of the silent voice whispering to my spirit that He was smiling’…the voice was silent, but it had a tone, and the tone included a smile, which is also silent. Is that how to do Bible study? Wait for God to drop/whisper/speak/tell me something directly, like a word, then go and look up all the times the word is uses in scripture, cobble together and acrostic, and tech about Jesus that way? IS Jesus speaking in a still, small voice? It seems that those who claim to hear Him are the majority while we ladies who stick to hearing from God through the Bible have become a minority. I still remember how startled I was when a young woman I was interviewing told me God had spoken to her, audibly. I was doing ethnographic field work in_________. This was the kind of [place] in which people sought an intimate, conversational relationship with God. It was not at all uncommon for people to talk about hearing God. In where? Where was she doing ethnographic studies where people say they heard God talking? Burundi? Solomon Islands? No. Chicago. In an evangelical charismatic church. Luhrmann continued describing her attempt of trying to either include or exclude the cause. She first thought of schizophrenics. The unusual auditory experiences reported by congregants just weren’t like that [the daily lengthy utterances that schizophrenics hear]. They were rare. Most people said they’d had one or two in their lifetime. They were brief — just a few words. They were pleasant. And they did not have that sense of command. It’s hard to understand how so many women can be wrong, but they are. They are either deceived, deluded, or lying, but they are not hearing directly from God. We begin Genesis 3 with a woman accepting extrabiblical revelation, (from the serpent) and we end the scriptures with God charging a church for tolerating a false prophetess Jezebel. (Revelation 2:20). There is a reason satan targets women in deceiving them they are hearing from God. We are easily deceived and we must always be in the word ourselves, be with our husbands or fathers in the word, and be in church listening to the word. The years upon years of Christian teachers and other leading women normalizing direct revelation has had untold and devastating effects on the faith. What power! Those people were terrified when they heard the voice of God. It shook them to their very being—and that was God’s purpose! This, of course, “is written for our admonition,” as Paul says in Romans 15:4. Moses writes this to impress upon us the connection between “voice,” “words,” and “power.” So powerful is the voice of God that it is a miracle that they lived through hearing it! Yes so many of these modern day false prophets claim to have heard God while shaving, driving, eating, etc, and they take it casually and go on with their day. We know the Scripture is rich and deep (Ps 119:18). Verbal plenary inspiration demonstrates that every word is inspired, God’s very own communication (2 Tim 3:16). The biblical writers exhibit this as they show how individual phrases (Rom 4:3-12) and words (Gal 3:16) of Scripture bring forth its sublime truth. The clarity of God’s Word leads to its precision and profundity. All of it, down to the word, is useful, powerful, and binding. In light of this, the question is whether we have done the hard work. Have I really studied a passage and understood the background, context, point, structure, theology, and applications of a text down to the detail of every word? Can I put all of this together so that I know precisely all the author has willed in this passage? Doing that takes hard work but that is the very nature of Scripture and what it demands (cf. 2 Tim 2:15). The reason that sermons, Bible studies, Sunday school lessons, or devotions lack depth is often because we haven’t spent the time and effort to go beneath the surface. Think about it. 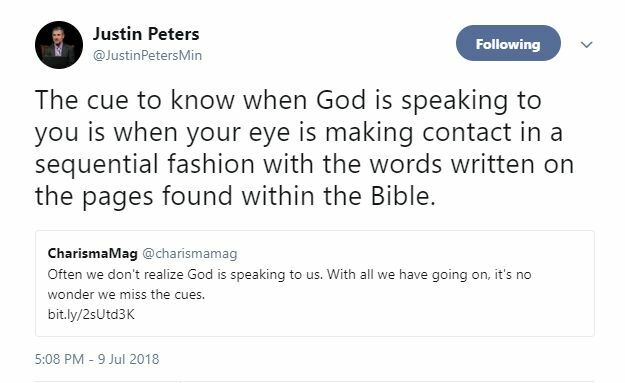 You can study the Bible by looking at “background, context, point, structure, theology, and applications of a text down to the detail of every word” or, you can simply be like Beth Moore and have God supply you with unsolicited data dropped directly into your head. Ladies, there is no still, small voice you’re missing out on. You’re not unworthy because it seems that God chooses to speak to so many other women and not you. If you never say “God told me” you are doing more than you know to uphold the faith. By saying “The Bible says in verse such and such” you are contributing building blocks for others to stand on. If you rely on His word as written in a good translation, you aren’t undermining scripture but instead you are honoring Jesus. Saying “God told me…” is saying “Scripture is deficient.” By relying on the Word alone, you are relying on the Rock, that shall never be undermined. did God speak to the prophets though or did they all just read off of the torah and use quotes to talk to the people? Do you mean rhema words? Thru angels, donkeys, directly, via earthquakes, thunder, wind, whisper, signs, thru dreams, visions, and to Moses face to face. THANK YOU! THANK YOU! Thank you! Seriously, this is a touchy topic for so many. This is the reason I wrote my book “Still Small Voice: What is God Saying to You?” because so many women are tricked into thinking they need to hear a word from God. A lot of people don’t like to hear this truth, but thank you for saying what needed to be said! Well done! But it distresses me that we still need instruction on this matter.